Dr. Rajesh did his MBBS from the University of Delhi (1985 – 1989) and his internship from Maulana Azad Medical College, Delhi (1990). His post-graduation in Surgery was from the University of Delhi (1991 – 1994). 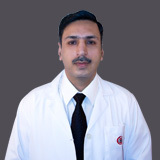 Dr. Rajesh completed his fellowship in Minimal Invasive Surgery from Ganga Ram Hospital, Delhi (October 1998). Minimal invasive/ Laparoscopic Surgery and Laparoscopic hernia repairs. Advanced laparoscopic procedures and stapler hemorrhoidectomy (MIPH). Fellowship in Minimal Invasive Surgery, 1998.